For teenagers and adolescents, acne and pimples are a big worry that can result in serious side effects in both personal and social life. To get rid of acne and its inflammation, various home remedies and methods with natural ingredients are widely used, including turmeric, mint, basil and more. Acne or acne vulgaris is a skin disease that affects numerous young boys and girls equally worldwide. According to medical studies, when the sebaceous glands get infected by bacteria or gets clogged with pollution, there is high chance of acne development. Most commonly, acne is observed in areas such as face, chest and back. 1. Blend 4 teaspoon of turmeric powder with 1 teaspoon of milk to make a smooth paste. You can even add in some honey in it. Store this mixture in a clean container and apply on the affected area regularly. You can even refrigerate this mixture for future use. 2. Another alternative way of using turmeric for acne problem is blending 5 teaspoon of olive oil with 8 teaspoon of turmeric powder. You can opt for sesame oil also instead of olive oil as per preference. Make a smooth paste and store it in a clean bowl for application on the acne area. 3. 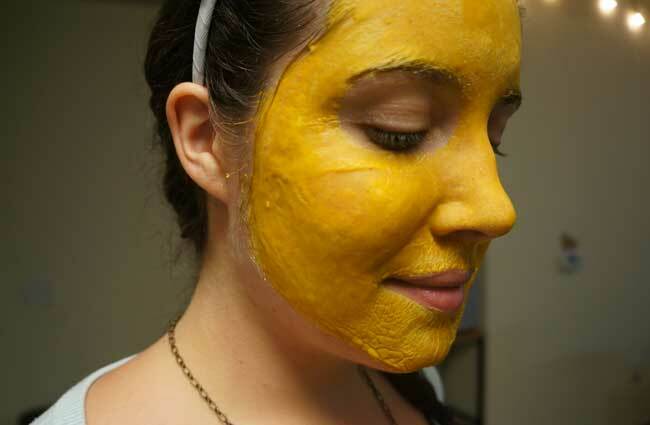 You can even opt for a turmeric mask to get rid of acne problem. Blend in 2 teaspoon of yoghurt with 1 teaspoon turmeric powder and a little of honey. Mix it thoroughly so that it becomes smooth without any lump. Apply it and allow it dry; wash off. Use this mask at least twice weekly to keep your skin free from acne symptoms. Yoghurt has lactic acid in it which is recognized as a good exfoliator. 4. Mix 2 teaspoon of turmeric powder with 1 teaspoon of oats in a smooth paste. Blend it and apply on the acne affected areas before going for bed. Massage it softly on the skin for 7-10 minutes and leave it overnight to dry. This turmeric paste will help reduce the size of acne within few days of application. 5. Use turmeric and honey mixture on your acne affected area thoroughly to get maximum relief from this skin problem. It moisturizes deeply in a natural way and makes your skin look flawless and soft. 6. Finally, whisk together egg white and turmeric paste to make a face mask. Apply it smoothly on the face and let it dry. Wash off after 15 minutes. If you have problem with raw egg smell, add few drops of lemon juice for better results. 7. Mix turmeric paste, gram flour and milk together to make a smooth batter without any lump. Regular usage of this homemade face pack can help reduce the acne problem over few days in a natural way. Apart from these above stated home remedies with turmeric, there are several medical solutions available too.